Yamaha's Crotch Airbag | OhGizmo! Yes, yes, we’re about four days late, but this is too good to just pass up on. 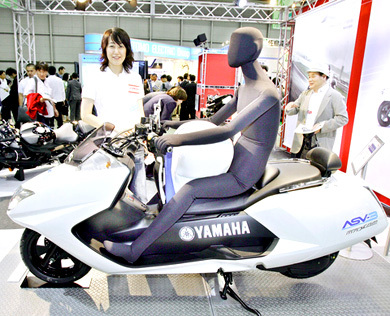 Anyone with certain equipment between the legs will probably feel a tingle of joy at the knowledge that the designers at Yamaha actually integrated their man parts’ well being into their latest scooter, the ASV-3. That’s right. If you crash while driving this thing, an airbag will deploy from under the seat, presumably keeping that particular point of impact a little safer. My issue is this: airbags tend to inflate with some violence. So, couldn’t this potentially increase the nuts/not nuts closing velocity, thus ensuring even greater damage?